Daisetsu Teitaro Suzuki was a key figure in the introduction of Buddhism to the non-Asian world. Many outside Japan encountered Buddhism for the first time through his writings and teaching, and for nearly a century his work and legacy have contributed to the ongoing religious and cultural interchange between Japan and the rest of the world, particularly the United States and Europe. 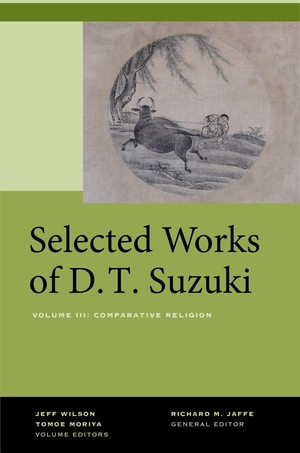 This third volume of Selected Works of D. T. Suzuki brings together a diverse collection of Suzuki’s letters, essays, and lectures about non-Buddhist religions and his thoughts on their relation to Buddhism, as well as his reflections on the nature of religion itself. Some of these writings have been translated into English for the first time in this volume. As a long-term resident of the United States, a world traveler, and a voracious consumer of information about all forms of religion, Suzuki was one of the foremost Japanese mediators of Eastern and Western religious cultures for nearly seven decades. An introduction by Jeff Wilson and Tomoe Moriya analyzes Suzuki’s frequent encounters with texts and practitioners of many religions, considers how events in Suzuki’s lifetime affected his interpretations of Christianity, Shinto, and other traditions, and demonstrates that his legacy as a scholar extends well beyond Buddhism. Jeff Wilson is Associate Professor of Religious Studies and East Asian Studies at Renison University College, University of Waterloo, and the author of Mindful America: The Mutual Transformation of Buddhist Meditation and American Culture. Tomoe Moriya is Professor of International Communication at Hannan University in Japan and a coeditor of Issei Buddhism in the Americas.